The Corona Sunsets Beach Okinawa bar serves Corona beer, beer cocktails and Mexican-style snacks on Chura Sun Beach in Tomigusuku. 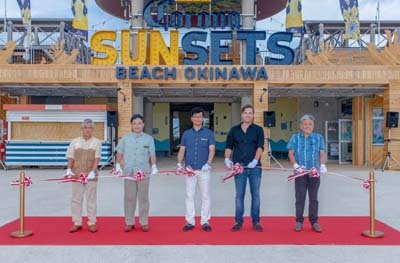 Molson Coors Japan Co., Ltd has opened a seasonal bar at Chura Sun Beach in Tomigusuku City that sells only drinks produced by the Mexican beer brewer Corona. The bar, named Corona Sunsets Beach Okinawa, opened on Jul. 1st, and is scheduled to operate only through the end of September. It actually consists of two bars. One is a Roof Top Bar, which has 44 seats, eight beach lounge chairs and a DJ booth, and the other Beach Bar that has 123 seats and another eight beach lounge chairs. 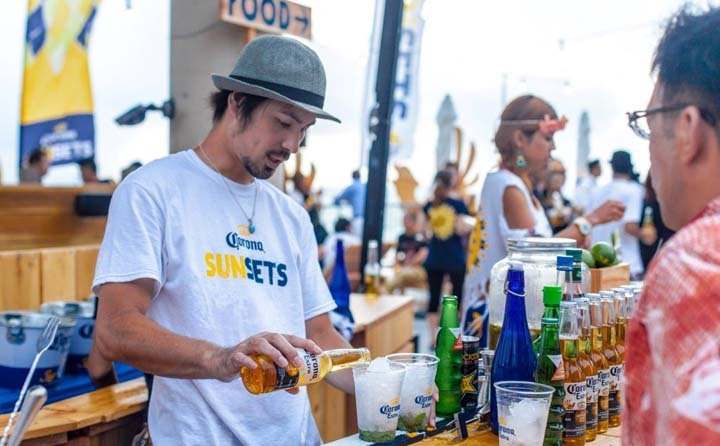 The Corona Sunsets Beach Okinawa opened on Jul. 1st and will stay in business through the summer until Sep. 30. The beach bar serves beer and beer cocktails customers can enjoy in the ocean view setting. Of course, Corona beer with lime is on the menu for ¥500, and original beer cocktails are also priced at ¥500. Mexican-style foods and snacks include tacos for ¥500 yen. The beach bar is open daily from 11:30 a.m. to 11 p.m. with the last order at 10:30 p.m. During special events, the hours will be extended by 2 hours. The biggest bash on the Corona Sunsets Beach calendar takes place on Sep. 12th and 13th, when the Corona Sunset Music Festival kicks off at 1:30 p.m. for the first time on Okinawa. This music event is held at various resort beaches across the world, in places like Mexico, England, Spain, Italy and the U.S. The events feature invited DJs and artists from in and out of the country, and entertain visitors with DJ performances and music stages with the ocean as a background. Advance tickets to the Corona Sunset Music Festival are currently on sale at Lawson Ticket or on the festival website http://corona-extra.jp/music-fes/. For quick buyers the cost is ¥3,000 for one day or ¥5,000 for both days until the end of today. From tomorrow through Jul. 26, the tickets cost ¥4,000 for one day and ¥6,000 for two days.